In this tutorial you will learn to create simple HTML form using jQuery script. We have just created a blank div (form1) in HTML. Using jQuery we are updating complete HTML form in the div (form1). You can use the code directly in any of your project. Html file – jqueryform.html : In this file, a div is assigned to a form. jQuery file – jqueryform.js : Here, form elements are append in form using jQuery script. Css file – jqueryform.css : Here, look and feel of the form is optimized using css. // Creating Form Div and Adding <h2> and <p> Paragraph Tag in it. // Create <form> Tag and Appending in HTML Div form1. }), // Creating Input Element With Attribute. 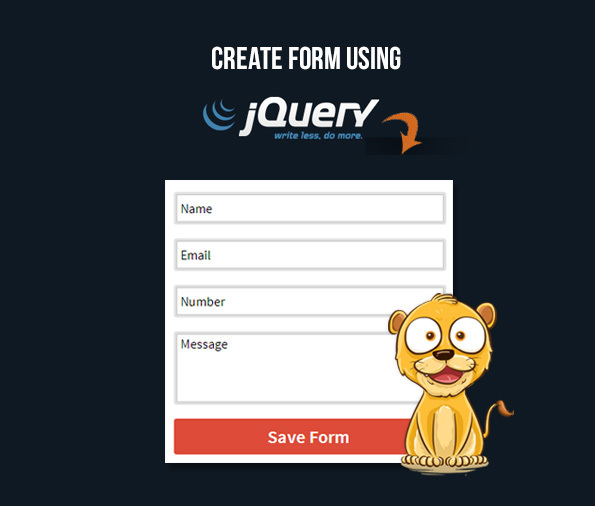 Hope, this tutorial teach you about creating form using jQuery script. It’s actually a pleasant as well as useful bit of info. My business is pleased that you discussed this convenient info along with us. Remember to continue being you current like this. Appreciate revealing.